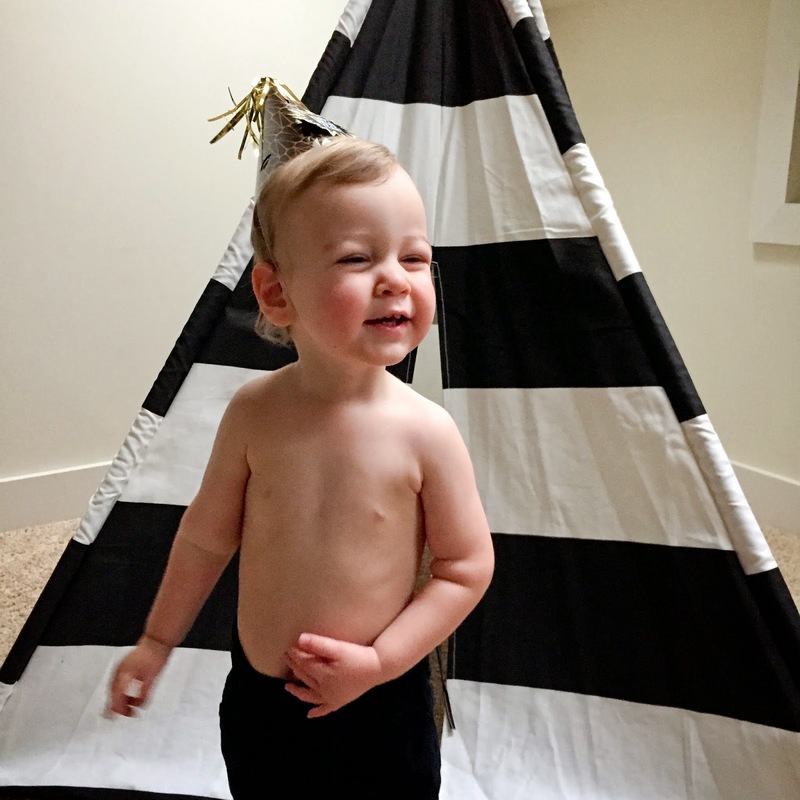 Our sweet Parker Campbell Klein turned 22 months old on January 18th! 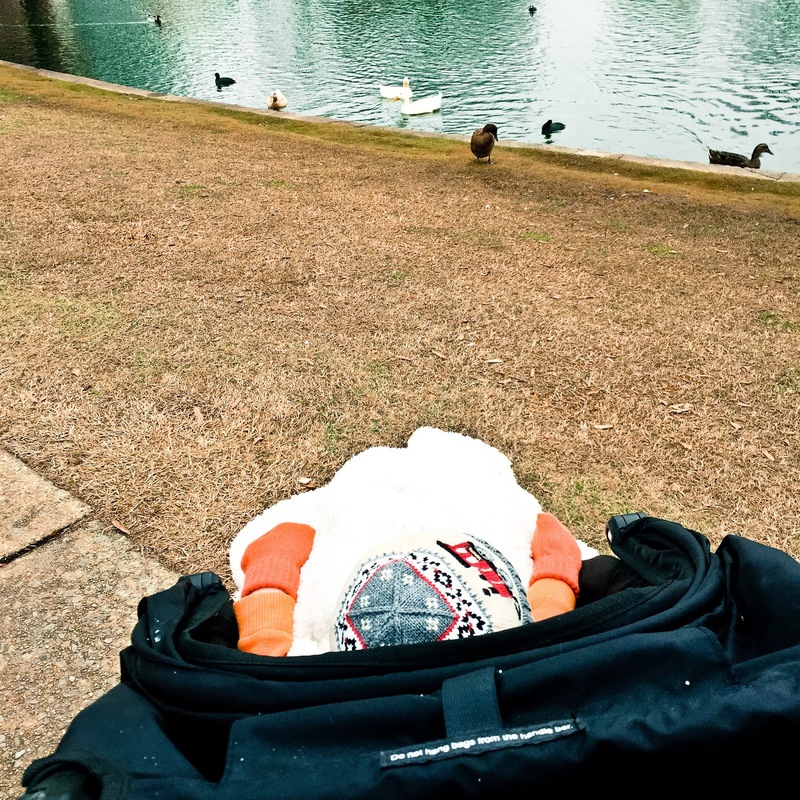 We moved to the condo in Alabama during month 20, and into the new house on his 21-month birthday, so we’ve all been enjoying our first cold winter here in Huntsville as a family. 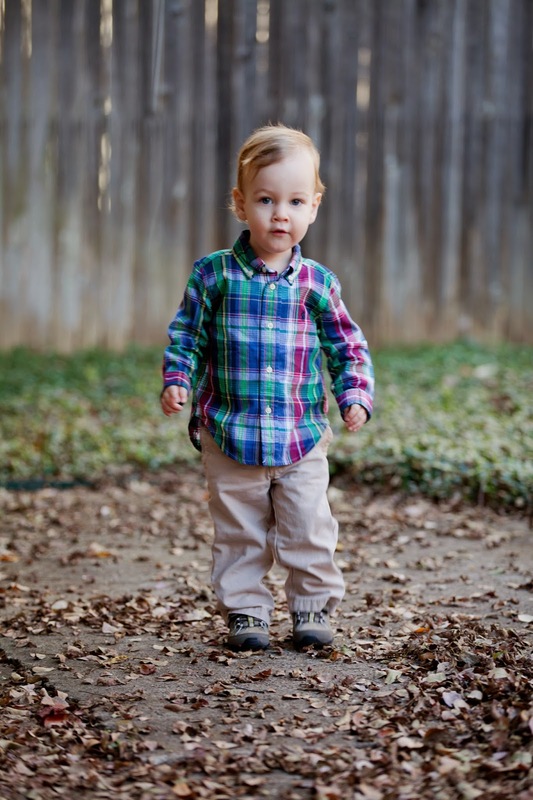 Parker continues to be curious, observant, happy, playful, and just the sweetest 22-month old you could imagine. Clothes: Though Parker went his entire fist year without needing a coat (Scottsdale sunshine, I miss you! 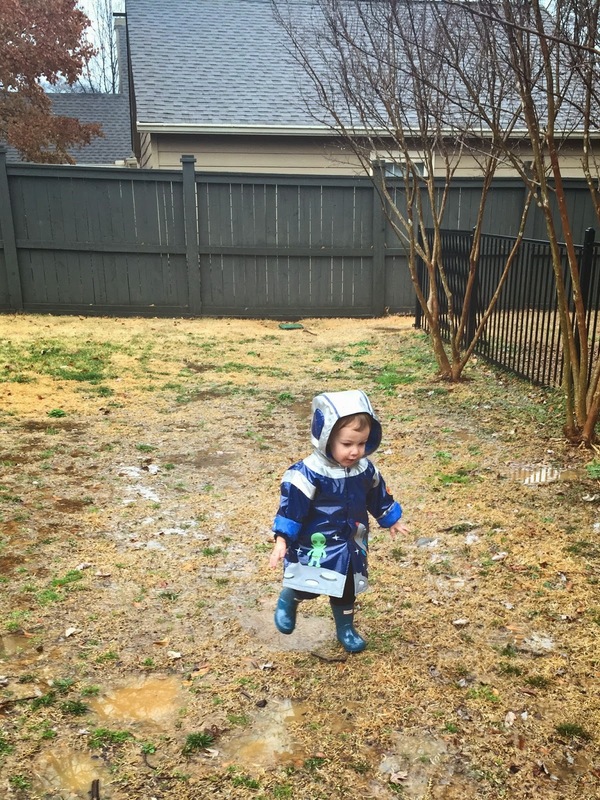 ), our first Alabama winter had definitely called for a jacket (and hats, mittens, etc. The lowest low we’ve seen so far was five degrees, eek!). Parker can still fit into some 18-month clothing, but it’s all mostly 2T now. We’re estimating he’s around 25 pounds (when we flew to California for Christmas, the luggage scale said 24.8… yes, the luggage scale, ha!). Health: The day after moving into the new house, littlest man fell on the wood floor and busted another tooth. Blood all over his face and one very freaked out mamma. The kicker was that he was barefoot on an open flat wood floor. There was nothing to trip on, nothing to make him slip, he just fell. I came to the realization that even bubble wrapping him would not prevent injuries. 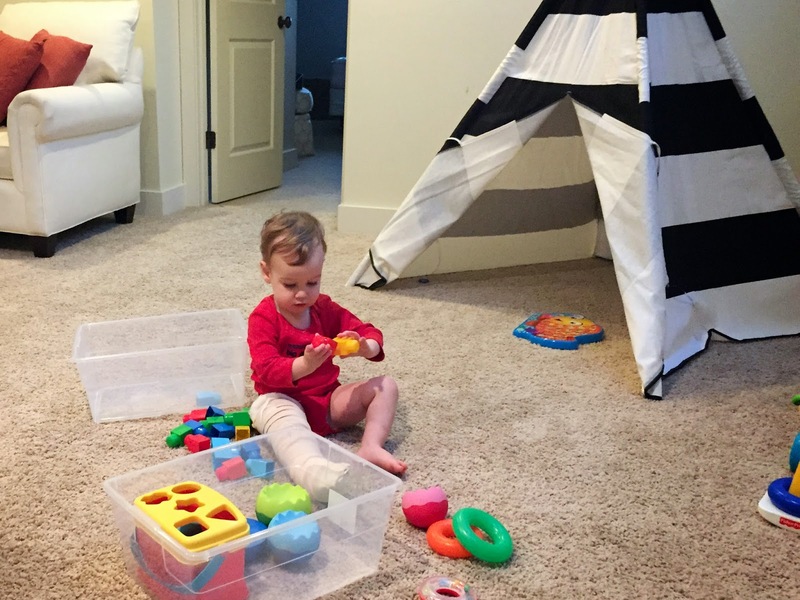 The very next week, Max and I were in the den with Parker when he, again, fell while walking. This time, it was clear that something was wrong with his leg. He refused to walk or put any weight on it. We phoned our pediatrician in Arizona since we hadn’t changed to a local one, and we were directed to get him to a doctor over the next couple days. 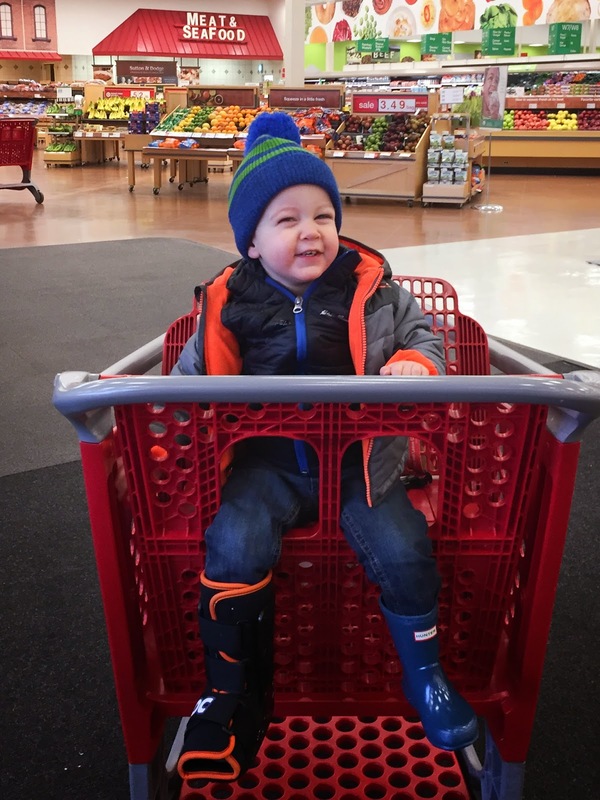 Parker’s leg wasn’t swollen, and he didn’t seem to be in pain, he just couldn’t walk on it. The next morning was filled with calls to every ped office I could find. 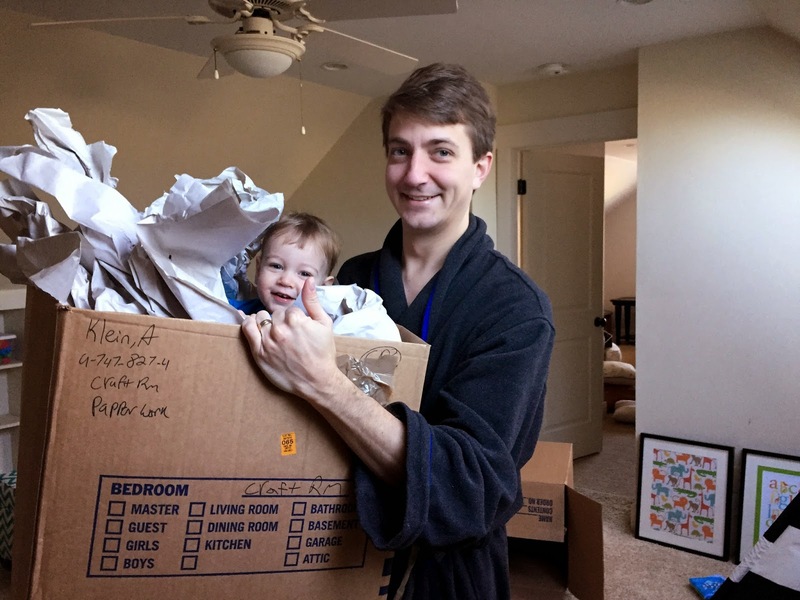 The lesson here – set up a new pediatrician before you move because when you actually need one, it will be too late. Every single one refused to see us and required multiple days waiting period for paperwork. So, it was off to the Pediatric ER we all went. We were actually really happy with how nice it was, and we appreciated that it was a mere four blocks away from our new house. They sprung some x-rays on us, which scared little man (we didn’t get to front load him about what was happening) so he cried right through them. Le sad. Then the doctor looked at his leg and moved it (more crying because that hurt him), and declared that little man had a fractured tibia. Oh, noooo. A nurse came in and wrapped Parker’s leg up in a splint. He was a champ for this part, and we even got smiles. 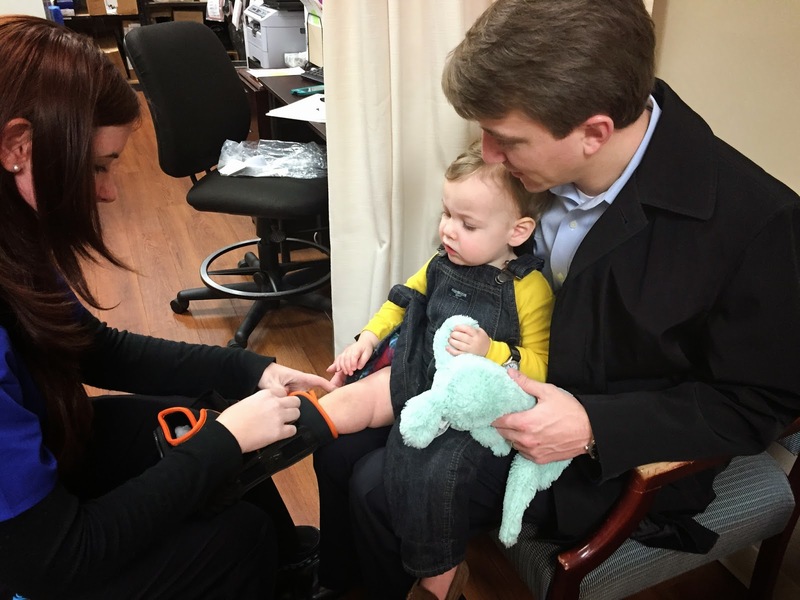 Two days later we saw the pediatric orthopedist, and Parker's splint was changed to a boot (this was an awesome switch as we could take the boot off for baths and sleeping). We knew they would be taking more x-rays, so we were able to tell Parker beforehand what was happening. This time he was awesome in the x-ray room! No crying and he even held still when he was supposed to. 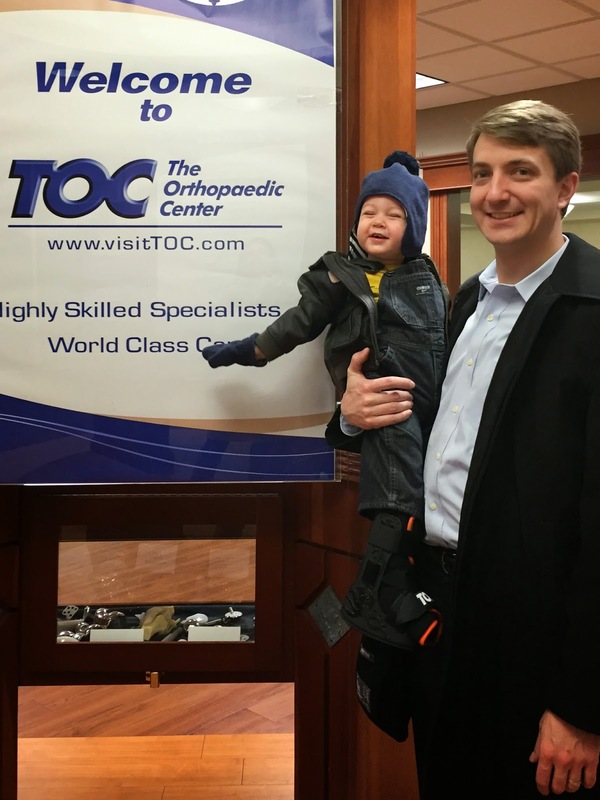 We loved our orthopedist, who was also just a two-minute drive away (our new house it winning all sorts of location points). I took comfort in the fact that the injury was something that would eventually heal. 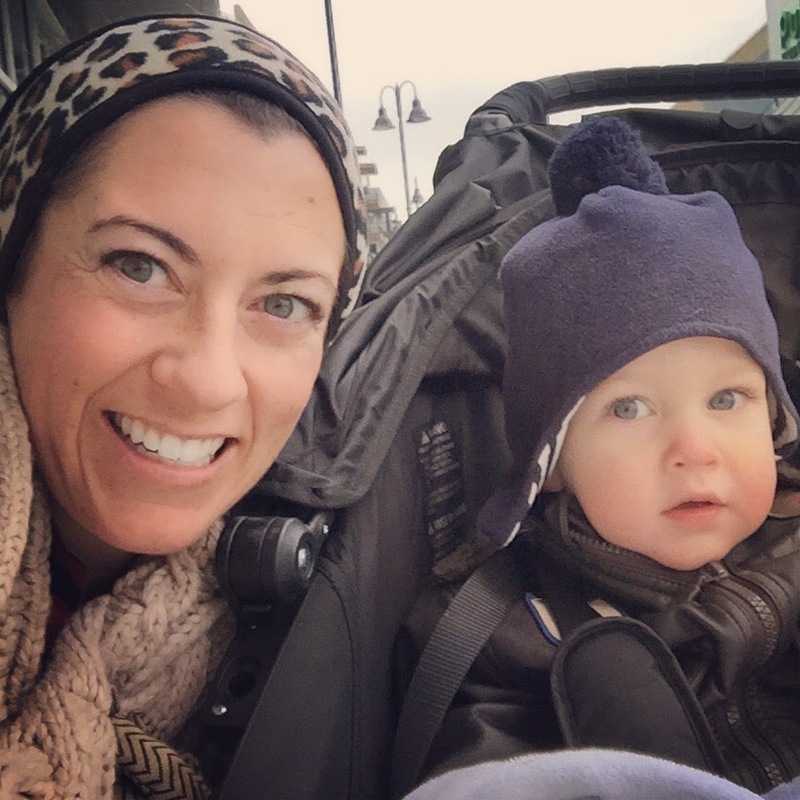 Parker didn’t have a chronic condition, or something that needed surgery. Really, he’s been a healthy little man and we are very blessed. Still, it was very hard getting the broken leg diagnosis, and even harder seeing our little guy who was a constant mover unable to walk. Watching his scoot around on his toosh? Heartbreaking! We of course are all trying to make the best of it. Almost four weeks in, he can now walk a bit while holding onto our hands, but he’s still very shaky. We have a few more weeks to go before he’s 100% again. 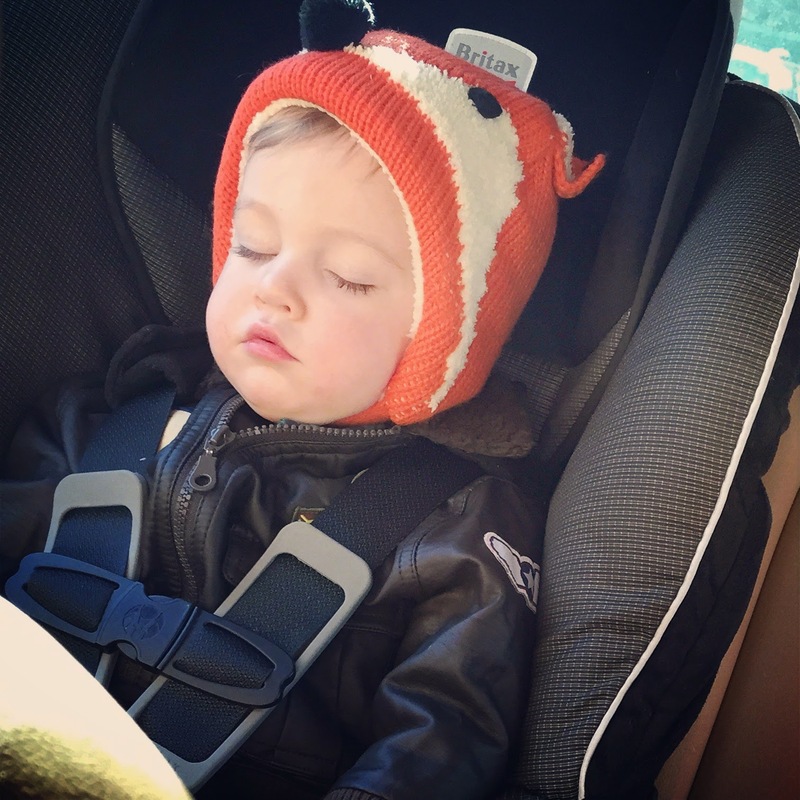 Sleep: Parker is down to just one afternoon nap a day and a 10-11 hour overnight sleep. Parker goes down so sweetly for both naps and nighttime sleep, getting songs, stories and snuggles beforehand, then happily laying down in his crib, always with one or two books and one or two stuffed animals. Lately he’s been wanting the books Goodnight Texas and Goodnight Baby Jesus in his crib. A while ago when one of the only words he could say was “gorilla”, he slept with a mini gorilla my parents sent to us. Lately, he’s been into the stuffed bunny I bought when I was pregnant. It’s his little comfort item and he’ll hug it and rub his face on it, and he even wanted it with him when we went to the ER and orthopedist. The two nights Parker had to sleep with his splint were a little rough and he had trouble falling asleep, but we found that totally understandable as we imagined it was quite uncomfortable. We were so happy when it came off! Diet: Parker has been OBSESSED with orange creamsicle smoothies. Obsessed. I made one for myself a couple weeks ago (blend orange juice, one orange, a frozen banana and plain yogurt plus a splash of vanilla extract, and thank me later because it’s heaven). Anyway, Parker wanted a sip and ended up downing my entire smoothie, and then asking for another one later. He did a little sitting happy dance with his legs while he was sipping them, which was adorable but also a little heartbreaking since he usually does a standing happy dance but couldn’t with the broken leg. He continued to ask for the creamsicle smoothies all day every day for the next week or so. I mean, we’re talking wake up in the morning and it’s pretty much the first thing out of his mouth. Now he’ll even imitate the blender sound and do a little shake with his head and hands. Other favorite foods are cream cheese, mango, dried strawberries, nuts (which he munched on for the first time in first class!) and eggs (scrambled or hard boiled). Likes: Parker’s very favorite things are road signs. He’s loved stop signs as long as I can remember (we’re talking single digit months old and squealing at them while on walks) and it’s been amazing to see this love grow as he develops. He began naming them whenever he saw one, and now also points out the letter “T” on them. When we moved to Huntsville in November, he began to see a lot of yield signs, which became his new favorite (he calls them “yeee”). He’s a fan of the triangle shape, and now calls all triangles “yeee”s, though we try to explain the difference. Parker was a lucky little man and was gifted stop signs and yield signs at Christmas, as well as an exit sign that “ghlooooohw!”s. Yes, his love of exit signs has not let up. In fact, now he can tell us about them. We’ll be sitting in the kitchen, and he’ll tell me “Cahcah” (Costco) and I’ll say “Oh, are you thinking about our trip to Costco?” and he’ll reply, “Da! Eyeh!” (Yes, the Exit signs) because we see lots of Exit signs at Costco. He’ll repeat this story for whatever store or restaurant is on his mind because of course we see exit signs everywhere. Parker continues to love books, and will want to find his favorite parts or pictures over and over. He loves riding in Dada’s project car. Mama and Parker will start heading into Pepper and Parker will protest and point to the garage and say “NeeNe!” (Sandy, Dada’s 911 convertible). Recently, Parker has been really interested in trains, which he calls “choo choo”s (we’ve noticed that he calls many things by the sound they make “Bah! Bah!” for a sheep, “Boo Boo Bee” for a ball, “Dee Doh” for the doorbell, “Goo Goo Gee Goo” for the washing machine, the list goes on). He loves going over train crossings and opens and closes his hands to represent the flashing lights when the trains are going by. Now that we are “in the country” we also see cows on a semi-regular basis. None this cute, obvi. Anyway, there is a farm right in the middle of the city that we drive by each time we go to Target. Parker gets super excited whenever we are driving by and makes his moo sound, and also makes an eating sound (sometimes the cows are chewing on grass). Then he’ll say “bye-bye” when we pass them. Little man also loves dogs, and requests to see them if we are facetiming family. Speaking of computers, we are holding with our “limited screen time and zero television” stance. Parker is sometimes allowed to look at pictures on our phones (like during an airplane flight on an 18-hour travel day or while waiting for the doctor at the ER, or just on the random occasion he wants to see a picture of a “choo choo”), but he has still never watched a TV show and the television is always off when he is awake. In fact, we haven’t even hooked our cable up yet at the new house, and it’s kind of nice not having that bill! Parker does like to listen to music, though, and will sometimes request we put some on. T-Swift is still his fave! He also loves being sung to; current favorites are Itsy Bitsy Spider, ABCs, London Bridge, Frère Jacques, and I Love the Mountains. 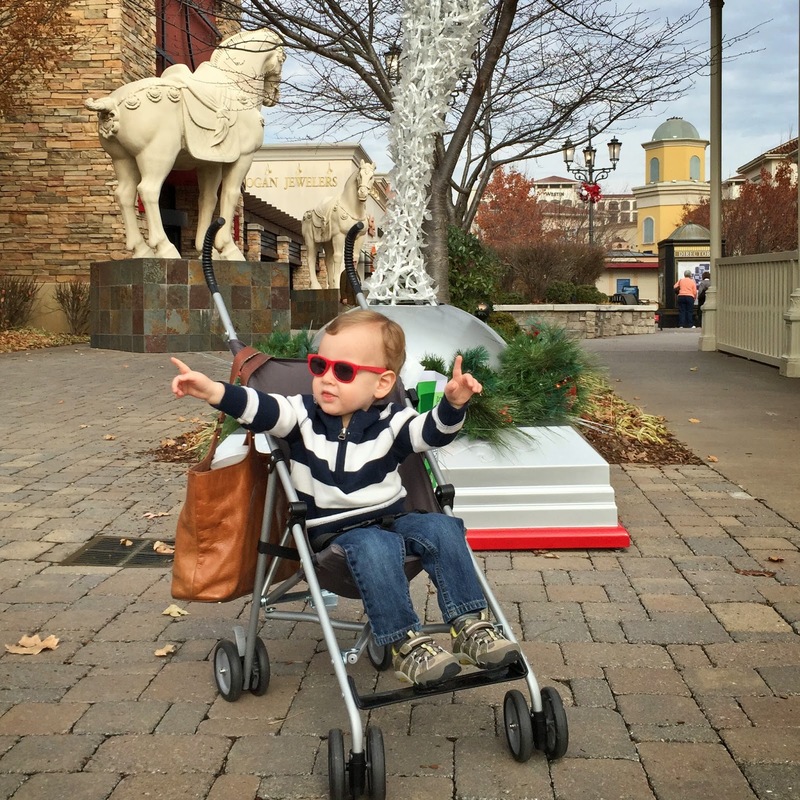 He will request them anytime and anyplace (during dinner, out shopping) and we love it. 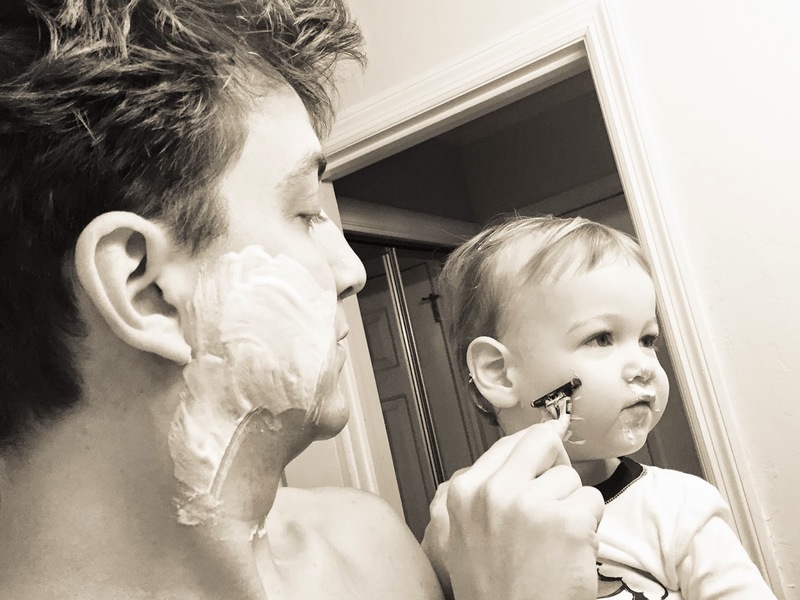 If Parker is up early enough on a weekday, he gets to “shave” with Dada, which is pretty much the best thing ever. Dada holds him and they both get shaving cream, and Parker waves and says “bye bye” as Dada shaves and the cream disappears. Then it’s his turn and Dada uses the back of the razor to “shave” little man’s face. He’s pretty much giddy with excitement the whole time. In fact, he’ll mimic shaving throughout the day with his hand, and I once said the word “shapes” to him while describing his star and circle and square blocks, and he got really excited thinking I had said “shave”, poor guy! We also have a bit of an issue with the words “blink” and “blank” – Parker knows blink (and loves blinking/flashing lights) so if we try to explain the word “blank” he only hears “blink”. It’s oh so confusing. 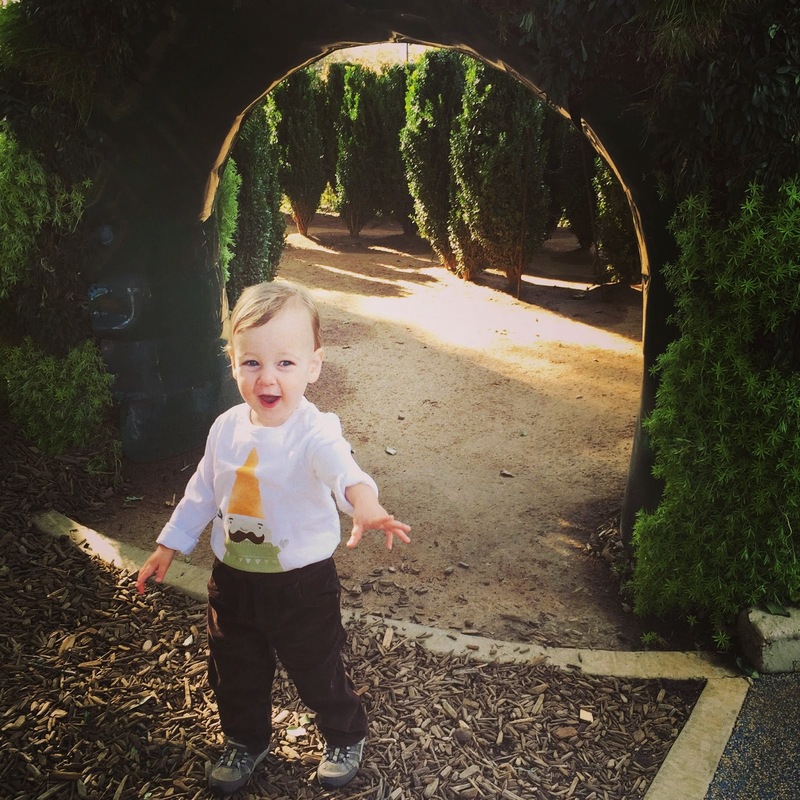 Social: Parker now laughs whenever we laugh, or anyone around us for that matter. We’ll be out at lunch and he’ll start laughing because the table across from us is. Parker is such an observer, and will say “bye-bye” and wave when diners stand up and start putting their jackets on. He’ll also say good-bye to anyone walking past our table. He loves waving and is such a little ham when we interact with people when we’re out and about. 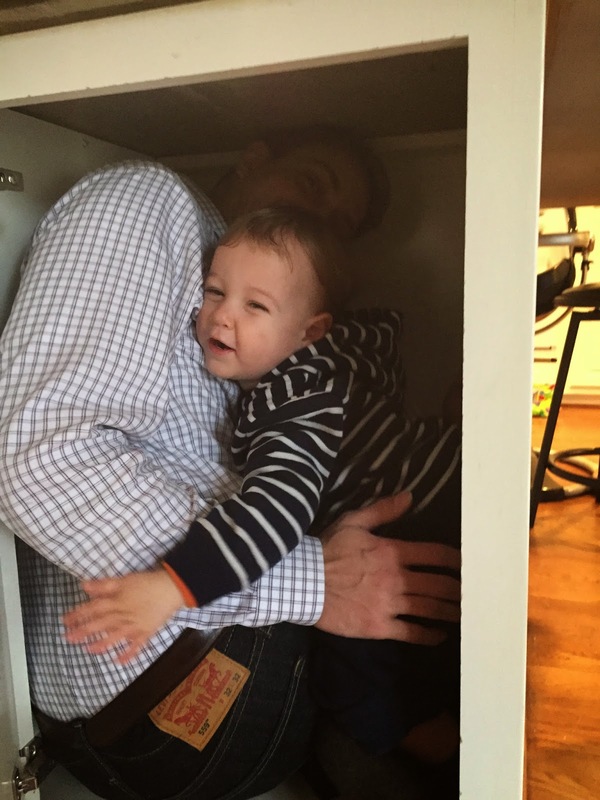 Parker has loved peek-a-boo for some time, and has stepped up his game. 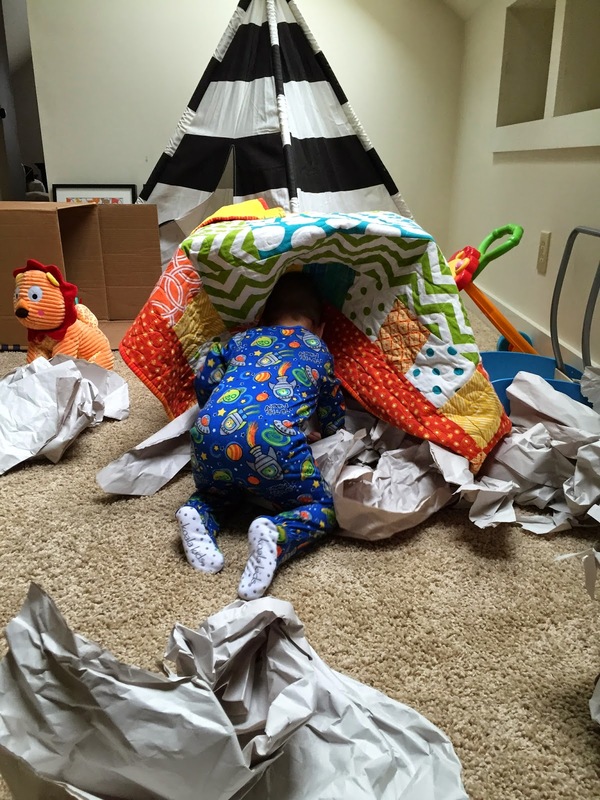 He’ll now hide (in his teepee, under a blanket, in a cabinet or a box) and instead of just making noise “Eh! 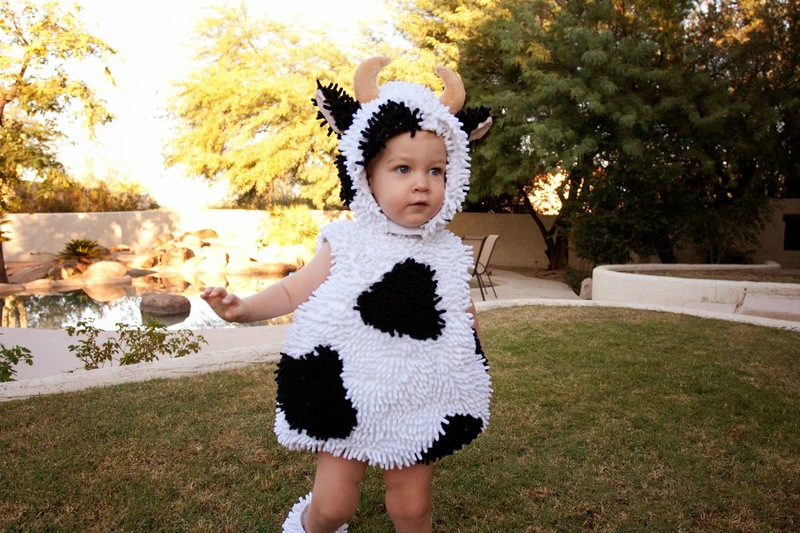 Eh!” he will “trick” us into thinking there is a lion “Raaah!” or a cow “Mmmm!” or a sheep “Ba! Ba!” or even one of the family members inside. It’s hilarious. Parker has also moved from talking about concrete things that he sees in the room (his milk, the light) to telling us whatever he’s thinking about or remembering. It’s freaking awesome as a parent to experience this. It’s also allowed Parker to request things. My favorite is when he asks for specific songs or poems I recite at naptime or bedtime. He’s been especially loving Dada singing Take Me Out to the Ballgame and Mama reciting Nancy Tillman’s On the Night You Were Born. We seriously could not be more in love with our little man. 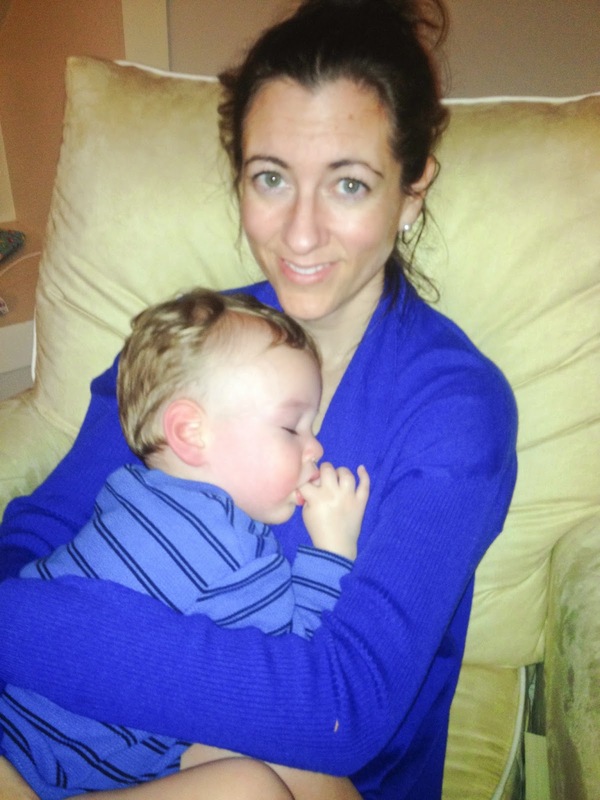 I realize he will be two in just a couple months, but he is still feeling like such a baby these days. 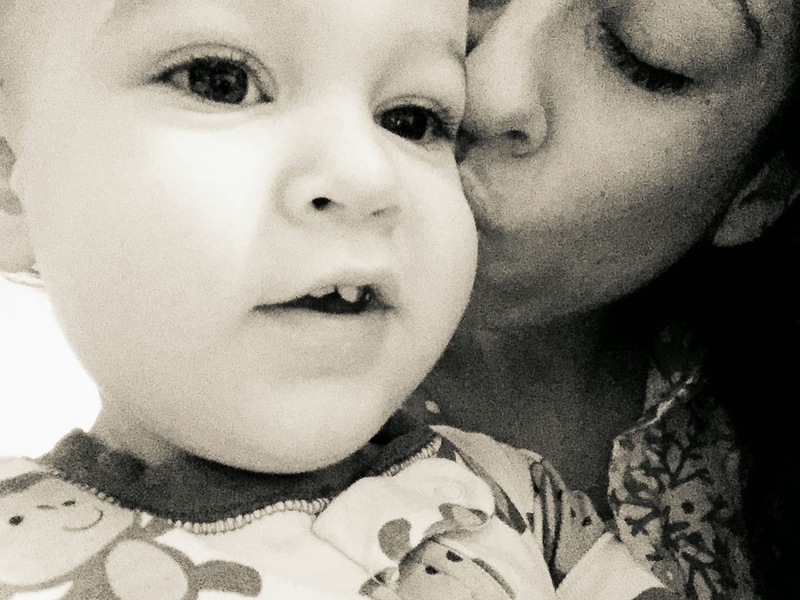 I’m cherishing every snuggle, every time he lays his head on my chest while sucking his index finger, every time I hear him say “Mama Dada!” just because he’s thinking about us. We really couldn’t be luckier. Poor thing - hope Parker's leg is feeling better. 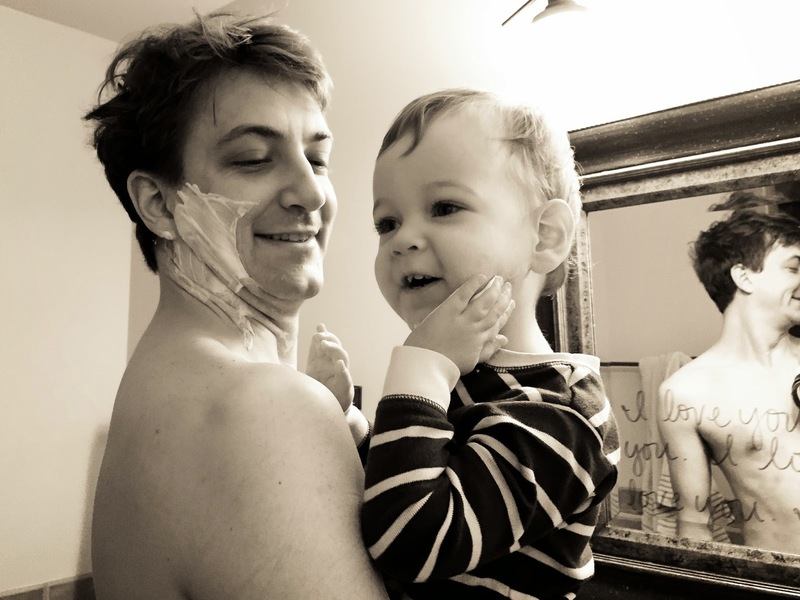 He is just adorable - love the daddy/son shaving!